FIRST TIME VISITORS: If you are here to find out more about the dyed red beards sometimes worn by Afghan men, scroll through the post responses for a discussion of the practice. Please also take time to explore the rest of the blog by clicking on the blog title in the banner so you can visit the homepage. This video appeared in several places on the web this week. It shows 101st Airborne Division soldiers engaged in a battle in Shimbowat wadi, near Camp Clark in Khowst province. 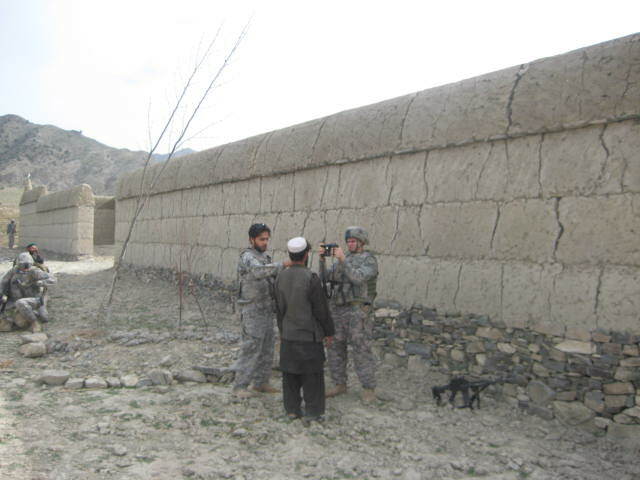 Toward the end, American soldiers are seen speaking with an Afghan elder whose hair and beard are died a hideous shade of red. I recognized the terrain because I have walked and driven up Shimbowat wadi many times. I’m about 90% sure I recognize the elder, whom I’ll call “Red Beard.” I was thinking of writing about him even before I saw the video. One night we positively identified that a rocket had been launched in our direction from the vicinity of Red Beard’s kalat. We countered with artillery fire of our own and in the morning we rode out to inspect the damage. We took pictures and retina scans of all the military-age males in the vicinity of Red Beard's kalat. This entry was posted on May 6, 2010 at 11:54 am and is filed under Uncategorized. You can follow any responses to this entry through the RSS 2.0 feed. You can leave a response, or trackback from your own site. Are you really writing from my battle space? I figured asnyone who’s bold enough to reference Melville must be the olny Pete Molin I know. I’m the PAO here at FOB Salerno for P2K. Hi Justin–I saw your name mentioned in several articles coming from FOB Salerno and meant to write. I was at Camp Clark and then FOB Lightning, so know P2K(+G) and the 203rd Corps leadership very well. I hope all is well and that the mighty 101st has brought peace to the region. Let me know if I’ve given away any secrets that might compromise the mission–I should probably have some sort of disclaimer on the blog anyway stating that all opinions are my own. And hey, if the Army wants to punish me by bringing me back to Khowst for another year, that wouldn’t be so bad. I enjoyed my year there immensely. I came across your piece (which I thought very well written) after I watched the first of the documentary series RESTREPO on the National Geographic channel. Whilst watching, I noticed a traditional looking Afghan with a vivid Red beard that was almost certainly dyed. This aroused my curiosity so I did a simple search & came across this page first. Strangely enough, there was also an incident concerning the death of a local farmers cow, though it seems the troops got to enjoy the meat in that case (I’m sure it was a welcome change from field rations). I am still curious as to why a traditional Afghan man in such a remote area would dye his beared red. The other thing that struck me is something that sadly seems to be the case in similar conflicts through history, which was that the locals were really caught between a rock & a hard place when it came down to which side they supported. I also felt very much more than I thought I would for the men posted over there, as in many ways they are in a similar position. Respect to you all & a fervent hope that peace can come to this war ravaged land sooner rather than later. this is really interesting, pete. thanks for explaining the “red beards”… you’re just about the only source i was able to find. Yes those Red beards really made me quite puzzled, I was half expecting to see some green Mohawk’s, Your reply put all into place &explained perfectly. It is good to know that as long as we are in Afghanistan we have intelligent men like yourself who have the ability to see the whole thing from a wider perspective. & to understand & respect the complex Afghan Tribal culture , whilst still keeping your eye on the ball when it comes to the unfortunate business of combat. I too found this website off google, searching for a description/elaboration on the red-beards after I watched Restrepo. Thank you very very much for filling us in!. I honestly can’t imagine how I’d feel being there. It seems to be the ‘typical’ situation of ‘racism’. Much as certain minorities here are profiled for certain things that they themselves may not do, but the larger majority of their ‘group’ are associated to be doing. It seems that these people are profiled on the same basis. Though I understand and respect their feelings, I do believe, as with any group of people. You have to understand, and accept that your people take actions that will have a greater, larger scale effect on your people as a whole. With that being said, I don’t think I’d survive out there, and I’m not sure I’d have the patience it appears to require. Complete respect!. Your article was well written and it seems this will be a bookmark-able site! I, too, saw RESTREPO (last night, as a matter of fact). I was haunted by it. The precariousness of that position, the close proximity to the enemy, and the emotions of the soldiers, especially when their BIA were killed, was powerful. My respect and utter awe of what those kids are doing over there is magnified 1000%. And, of course, I was curious about the red beard business. Thanks for clearing that up. I was also amazed at their eyes – they looked like they were sporting eyeliner! But, I have another question. In the Doc, they show a couple of small children whose hair is also dyed that same unnatural red as well. Very strange. Left overs from granddad’s dye job? Weird. Anyway, hats off to all those severing in the armed forces, but particularly to those in Afghanistan. I saw Restrepo just last night. I was greatly impressed by this documentary. I was even more impressed by the Soldiers. Thanks for the info on the red beards. I too, was wondering about that. I am currently a DoA civilian who works on the Army Staff and have always felt proud to work for the Army. After watching Restrepo last night, I couldn’t be prouder! After watching Restrepo last night (Jan. 24, 2011), I hunted online for some cultural insight into the “red beards.” Many thanks for the info. I also wanted to say that I came away from the documentary impressed, amazed, and humbled. I was impressed of course by the soldiers and their lives while posted to such a harsh environment for 15 months; I was equally impressed by Sebastian Junger’s embedded reporting, allowing the soldiers to speak for themselves. It takes guts to report on a very dangerous situation at such close range, and even more guts to remain there when the reporter isn’t required to do so. My best to the soldiers, and to the reporters who give us non-military folks at least an inkling of what life “over there” is like. Also: Thanks for the Benito Cereno reference. I especially enjoy when a person gives greater insight into an incident by referring to one of the classics, even if Melville’s story is one I haven’t read since college. If being in Afghanistan feels like being in Amasa Delano’s position, then operating there must be nothing less than precarious. Thanks, Sean–especially glad to know someone appreciates the Melville reference. I’d like to say we operated more cheerfully and boldly than Amasa Delano, but he was pretty jaunty himself much of the time (stupidly so). The big thing to do was to be able to live through the moment knowing that at the end of it you were going to know things you didn’t know before, and probably realize that you made a mistake or two along the way. Nothing was ever going to work out according to plan, but not doing anything was never an option. my husband is currently in Afghanistan and has told me stories of men and young boys with eyeliner, red hair/beards and nail polish. I understand the meaning behind the hair and beards, but have been unable to find any reliable information on eyeliner and nail polish. since he has been deployed i have become quite interested in learning about their culture. any additional information you may have would be wonderful! http://captaincat.typepad.com/captain_cats_diaries/. Very smart and very entertaining on tribal rivalries, women’s affairs, politics, and culture. hello to every one. eyeliner nail means nothing in afghanistan but for somepeople that they are working hard in the forms and wood cuting they feels pian and as there fothers told them ‘hena’ is good for pian they do it so, also there well question why children do this, for them it is styel. My self i do remember that my grant ma was telling me the nights of eid that i should put hena on my palm and my smal fenger. But all afghans puting hena night before wedding. And about older my best friend peter is right but just half pashtun tribe are doing this in certen parts of afghanistan. sorry that i did not said about eyeliner. The things that afghans are using on there eyes we call it ‘surma’ most afghans are use this for there chiled under age of 3 because they thing it’s curable and makes good lookin eyes for children, and some of them continue this until age of 10 or 12 ofter these age this is style for them and for some of them it’s cultuer also most of the taliban are use this iam not sure because of the cultuer, fear or religes or something that themselfs know. Older people do this just like children but not for good looking it’s cureable. Hedayet: Thanks for telling us so much about henna and “surma.” It is a very interesting subject for us Americans who saw Afghans die their hair, use eyeliner, and paint their fingernails but didn’t understand why. I have one question: What do you mean by “curable”? Does that mean that the dye is not permanent? Or does it mean that the dye acts like medicine? yes sir it acts like medicine in there idea. And about nail, when they use henna in the skin it stay for 1 or 2 months but on the nail it stay for 3 or 4 months that is why you can not see colore in there skin but you can see it on there nails. And people thing they color just there nail. Hi Peter, I just watched “Restrepo” last night and wondered about the dyed-beard business, so thanks for an informative post! I didn’t notice any nail polish in the film, but it occurred to me that the eyeliner might have once had a practical application: to reduce sun glare in the eyes, much like how some athletes smear greasepaint under their eyes. (There’s a theory that the ancient Egyptians wore eyeliner for the same reason). The Melville reference is a neat metaphor for the situation, and seemed even more appropriate after reading your above response to Martin’s second question–especially the part about drinking tea with people who likely have (at least) second-hand knowledge of attacks on Americans. I think the whole segment beginning with “It was a rare day when we could catch an insurgent with weapon in hand…” dovetails nicely with the end of the original post; to me it almost reads like a continuation of the ‘Benito Cereno’ metaphor. Thanks Angus–don’t know about the use of eyeliner as a glare reducer, but maybe my interpreter Hedeyat can tell us. To live in that stark and shadeless landscape without sunglasses would be brutal. “Red Beard” post continues to attract more readers and comments than the rest of my blog combined! Thanks to Restrepo, I suppose. But do poke around a little and let me know if anything else interests you.